After Kim Hill’s convincing and justified dismantling of 9/11 conspiracy theorist Richard Gage on her show yesterday, I was expecting a large turn-out for Gage’s 2pm lecture at Te Papa that followed his appearance on the show. But not quite that large. Te Papa’s Soundings theatre was completely full, so I watched the lecture via telelink along with 300 other people in the museum’s conference venue on level 3. I’m sure Te Papa breached their fire regulations – there was barely room to sit on the floor. Altogether, 620 people gathered to hear Gage talk. A poll taken by Gage at the start of the lecture revealed the majority of those gathered believed the collapse of the World Trace Center towers and 7 World Trade Center was an inside job, the result of controlled explosions. By the end of the 3 hour presentation, by which stage a number of people had walked out, Gage repeated the poll and found the number of believers in the conspiracy theory had increased. “95 per cent of people who come to our presentations end up agreeing with us,” he had earlier told Kim Hill. Gage: There are psychological barriers to reexamining what we thought was true. Hill: It’s a psychological barrier against complete irrationality. Hill, in my view, hit the nail on the head. Does this look controlled to you? Gage’s presentation lurches from dense scientific analysis of nano-thermite through to snatches of eyewitness accounts to wild speculation on the reasons for the US Government wanting to intentionally bring down those buildings. If he stuck to the science and engineering, he would have a much more convincing argument but would have seen half his yawning audience gone before the one hour mark. Instead, Gage realises he has to sell the conspiracy, potential motives and all, to keep people lapping up his Dan Brown-like story. And that’s where it all unravels. Hill points out the more farcical elements of his theory – the claim that BBC and CNN presenters reported that 7 Word Trade Centre had collapsed before it actually had, because they’d been fed information from the people behind the conspiracy. There’s the footage of the eyewitness on the street who seems calm and has a convincing explanation for the collapse just minutes afterwards that aligns with the official version. Gage suggests he may have been planted by those responsible. But the most ludicrous claim is that hundreds of people were involved in an operation to plant explosives throughout the three buildings and to arrange the planes to fly into the twin towers, to detonate the explosions and bring the towers down in a demolition exercise akin to those used to bring down aging Las Vegas casinos. As the Americans say, give me a break. Sure, there are unusual things about what happened that day – 7 World Trade Centre was the first collapse of a skyscraper attributed to uncontrolled fires. There’s the sulfuric compounds in the debris of the towers fuelling the suggestion thermite may have been used as an explosive to bring the towers down. And the towers did seem to come down in a fairly uniform way, rather than toppling over and taking out swathes of lower Manhattan. But answer me this Mr Gage: why would the conspirators behind 9/11 risk discovery to save surrounding buildings when they were already committing to killing thousands of people and destroying the largest, most iconic buildings in New York city anyway? It just doesn’t add up. What happened on 9/11 was almost unbelievable, but not totally so. We’ve never seen anything like it before, which makes what happened so hard to understand and even scientific explanations of it so difficult to fully accept. But this was the first time we’ve seen jetliners flown into buildings with the intent of taking them down. An unusual set of circumstances created an unusual set of outcomes. Anyone giving Gage the time of day should also look at the other explanations experts have given for what happened. This Popular Mechanics cover story from 2005 for instance debunks some of the major aspects of the 9/11 conspiracy story. Gage told Hill that people allied with the Bush administration and the people behind the NIST report into the 9/11 tragedy got to the Popular Mechanics people in the editing stage of the piece, pressuring them into towing the official line. Also check out the list of 300 experts Popular Mechanic assembled to check the facts for the piece. Are they all in on the conspiracy as well? It’s no mistake that Gage begins the technical part of his presentation by looking at the collapse of 7 World Trade Centre. Of all the things that happened that day, the collapse of this building is the most puzzling, given that the official explanation for its collapse – damage from debris falling from the WTC north tower and fires throughout the building weakening the structure, isn’t really supported by evidence from previous skyscraper fires. If you wanted to humour Gage for a moment, you could dream up a semi-credible conspiracy theory for the collapse of this building alone. Given that the building housed tenants including the CIA, the SEC and other US Government agencies, its tempting to think there may have been something held in 7 World Trade Centre that someone didn’t want getting into the wrong hands. 7 WTC collapsed hours after the twin towers and was totally evacuated before it did. That would be enough time for a small crack team to get into it and wire it for demolition extracting or destroying from whichever offices, the sensitive whatever it was – files, data, gadget, photos – who knows. Even that scenario sounds like a plot line from 24 or Prison Break. Gage on the other hand, loses the plot entirely by trying to bring together disparate strands suggesting the media, the military, government departments, elevator maintenance companies, private security firms and insurance giants were all acting in unison in the hope of profiting from the resulting wars that the US waged. Its for this reason that the successful architect turned conspiracy theorist will for the rest of his career be considered a crank. And this is why Kim Hill treated him with thinly-veiled contempt on her show yesterday. 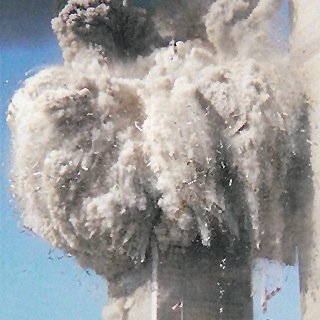 I think you are guilty, as is Mr Gage, of underestimating just how much work is involved in doing a controlled demolition that drops a building – especially one that has irregular load-bearing structures as was the case with 7WTC – into its own footprint. The people who do that it for a living spend many days clearing and wiring a building. It’s not something that can be done in a matter of hours, in a building that’s on fire, and still achieve such a neat result. The preparatory work that goes into structural demolition with explosives is thoroughly documented all over the internet. Ask Google. If someone were to suggest that the building had been constructed with self-destruct systems integral to its design, I would be more inclined to believe that than I am to believe that there was a post fact mission to wire and demolish it as neatly as was achieved. And, of course, the risk of an in-building self-destruct system would be “the wrong people” finding out about it and working out how to trigger it. Not exactly something one wishes to risk their life over, no? Nanothermite might have a wikipedia page devoted to it but from what I’ve read about it it’s not at all clear that it actually exists. Totally agree sn00ker. By demanding an investigation into the company responsible for the maintenance of the World Trade Centre’s elevators, he is suggesting that in the run up to 9/11 work was done in the lift shafts to plant explosives to produce his controlled demolition. However he doesn’t seem to account for the impact the planes crashing into the buildings would have on the carefully laid plans for the controlled explosions. The whole thing is ludicrous. WFC7 was a controlled demolition. In my eyes tehre is NO otehr way that that building could have come down. I have always had my doubts about teh collapse of the twin towers and felt that if they had come down by the plane crash, they should have fallen over and not straight down at almost freefall speed. Jet fuel burns with an orange flame and is well under 2000 degrees F, well below the melting point of steel. No jet engines melt when they are in operation and neither does kerosine heaters. And a fire with a lot of black smoke much burn a lot cooler than and fire in a jet engine or a heater where there is little or no smoke. So i am convinced that WTC7 was demolished but i am less sure about 1 & 2, the towers. But whatever I think will make no difference to what ever actually happend. I went along to see Richard Gage in Auckland after the worst interview i ahd ever heard Kim give. Totally hostile and showing all the skills of a great impatial interviewer. Yea, right! So I am still open on 1 & 2 and I am prepared to listen to facts, if there are any. But what has Richard got to gain? He has lot income and all he wants is an INDEPENDANT inquirey into the collapse, something they did not have the first time around. More was spent on the stains on Monica’s dress than this “investigation”. Has anyone ever thought that Hi tech weapons could have been used? Surely we’re not so naive as to think that plain old explosives were used? If laser/microwave technology can be used in every day life then why could it not be used in military/secret ops? If you’ve seen what a microwave does to a metal spoon then an understanding of what could have been used in the towers should come to our attention. This microwave technology is invisible, I’ve never seen any blasts in my microwave until you put metal objects in there. As far as rigging the towers is concerned, this would be too much of a task to complete discretely whilst normal business is going on. I bet this post will be Modded!